After watching his filly Walkwithapurpose cruise to her fifth straight victory in Saturday’s $100,000 Caesar’s Wish Stakes by 9 1/2 lengths, Correas admitted he would like to see Laurel Park’s winter meet continue for a while longer instead of ending on March 30. 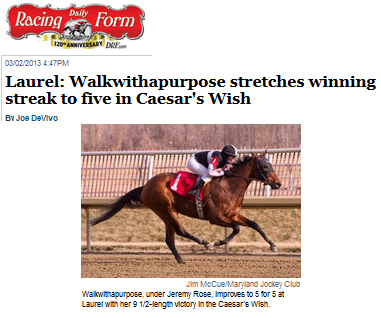 “I wish we had another month at Laurel,” Correas said after the 3-year-old Walkwithapurpose ($2.80) ran her Laurel record to 5 for 5, including three stakes, by completing a mile in 1:38.38 under jockey Jeremy Rose. Instead, Correas will have to get Walkwithapurpose geared up for a new challenge and a new racetrack. She will be asked to handle two turns for the first time in the $75,000 Twixt Stakes for 3-year-old fillies going 1 1/16 miles. That is a prep for the Grade 2, $500,000 Black-Eyed Susan Stakes on May 17. Walkwithapurpose did have to deal with some early pace pressure from stretch-out sprinter through the first half-mile in 47.29 seconds, but opened up a clear lead with about a quarter-mile remaining and won for fun. The one-mile Caesar’s Wish turned out ideally for Correas and owner Sagamore Farm. In addition to the winner, the connections also sent out Listen Boy, who finished second at 45-1. Correas said he was expecting a good performance from Listen Boy, despite two ugly looking past performance lines in her last two races.